Established in March of 1973 and now celebrating over 45 years in business, Antony & Cleopatra Caterers has served over 10 million people. Our private location sits on a picturesque landscaped 40-acre property. We can accommodate large weddings and events in our Chandelier Cleopatra room while hosting smaller parties in our signature Antony room. In addition, we are also a preferred caterer at venues across South Jersey including the Moorestown Community House, Cape May Beachfront Ballroom and Smithville Mansion. We were "Voted Best Caterer and Best Place for a Wedding Reception" in 2017 by the Courier-Post and numerous other awards to our credit. We have achieved these honors by being 100% customer service oriented! 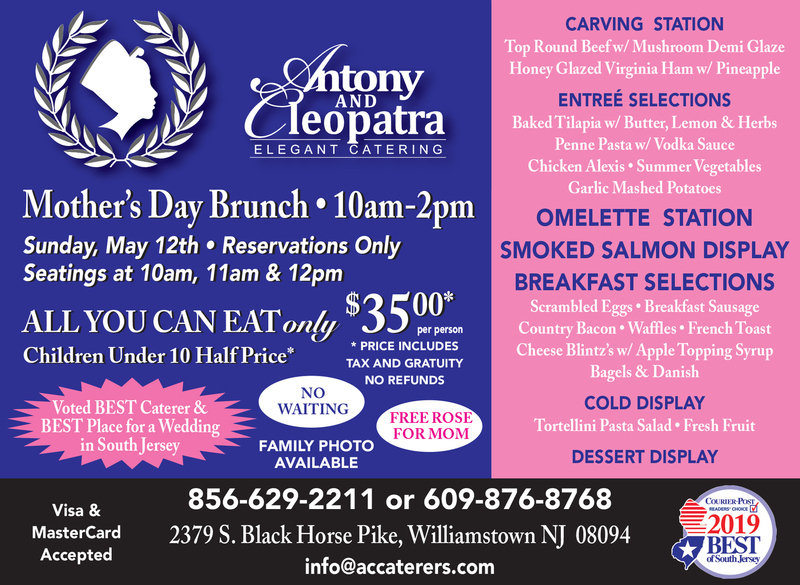 Thank you for making Antony & Cleopatra Caterers the best!